Fire crews across Cheshire tackled a large barn blaze at a farm in Tarporley last night. The fire broke out at around 10.40pm on Hickhurst Lane, Tarporley. Firefighters tackled a blaze in a bungalow in Nantwich. It happened at 10.40am on Cheyne Walk, with one fire engine attended from Nantwich and two from Crewe. A car fire in Willaston near Nantwich is being treated as suspicious, fire chiefs confirmed. The blaze broke out on Green Lane in Willaston at around 10.30pm last night (July 4). A rapidly spreading blaze on a railway embankment in Crewe has caused delays to local services. Firefighters have been battling the blaze off Dunwoody Way in Crewe since it started at around 1.20pm today (June 29). A large number of birds have died in a fire at a farm in Tarporley, fire chiefs have said. The blaze happened at a farm on Peckforton Hall Lane and involved two large wooden sheds, each about five metres by three metres. Fire crews spent an hour battling a chimney blaze at a house in Aston, near Nantwich. 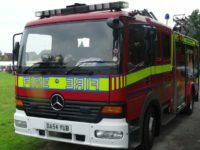 The fire broke out at around 6.50pm last night (April 13) at a property on Wrenbury Road in the village. Police and fire crews were called to a vehicle blaze in a field in Nantwich. The incident happened shortly after 6.30pm last night (March 5) off Crewe Road. Performers finished in a blaze of glory at Crewe Lyceum – after a fire drama meant they ended their show outdoors! The incident happened during the final night-time performance of the popular production, Birdsong.